Looks like a great book and a great giveaway! I've just really gotten started with beading and am finding myself enchanted with all the metal. What a great giveaway! I haven't seen this book yet, but it looks like it might be a good one if you are at least a step past a beginner. Have a great day. Hope YOU have the sun that I DON"T!! I sign in as always!!!!! I hope I will be luckier this time!!! And also the sharing on Facebook is done!!!!! Yep, you bet I'd love to have that book, lol. I've been enjoying your blog too! I've had my eye on that book as I'm looking to improve my wire skills. I have so wanted this book! Thanks for the chance! Looks like a good book for a home library. Thanks for the opportunity to win it! I've been dying to try working with metal. I'd love to win this book. I've also linked to this post on Twitter. What a brilliant looking book. Just the section on soldering jump rings would be worth the price of the book. I spend so much money on pre-soldered rings. I just took a silversmithing class to learn some stuff to help with enmeling ideas. It was fun. This book would be super handy! I am always looking for better and new ways to do things. I would love to have a copy of this book! you can NEVER learn too much!! 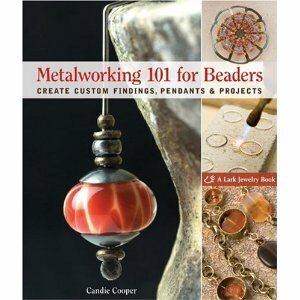 Oh would I love a copy of this book...I am fairly new to metalwork & would absolutely love to learn more! Fantastic opportunity! Just took a metal forming class at B&B and want to take more steps to include metal with my beading. I just shared on facebook. Thanks for the amazing offer. What a great-looking book! Fantastic giveaway! I would love to win this book as metal work is my next project I want to learn more of. I am interested i being able to make my own findings and get into stamping and forming and riveting. I'm a book-lover as well as a bead-lover, so this would be great! I've just gotten into wire and metal working after taking a fabulous workshop with Mary Hettmansperger. This looks like a great book. Thanks for your generosity and I love your blog! The book looks right up my alley. I'm always trying to improve my metal skills. Going over to FB now. This would be a terrific gift for me. I'm just starting wire-working, and my library doesn't have this. I think it would be lovely to add metal skills to my polymer clay beads - I really want to learn to make bead caps! Looks like a great book!! Thanks for the opportunity to win it!! Cyndi I want to tell you that I have been following your blog and find it very helpful, fun and inspirational. As for Metalworking 101, after 30 some odd years of saying I want to work with metal, I am finally starting to. As I am selftaught in a lot of techniques this book would be a godsend for me. There aren't a lot of classes here that I can travel to or afford. I've allways wanted to learn how to make my own metal findings (besides earwires, jumprins and some easy clasps :D)! You have a great blog and I've learn a lot of things here! Thank you!